Why have promotions stopped working? Have you made any changes to your promotions that could cause the promotion not to trigger? Check the scheduled start and end date as well as the filters and triggers you have configured. Have you deployed a new theme? When you deploy a new theme that doesn't include Discount Ninja's assets, promotions will no longer trigger. To correct this follow the procedure outlined below to reinstall your assets. Have you disabled the app? Check in the settings if the app is enabled. 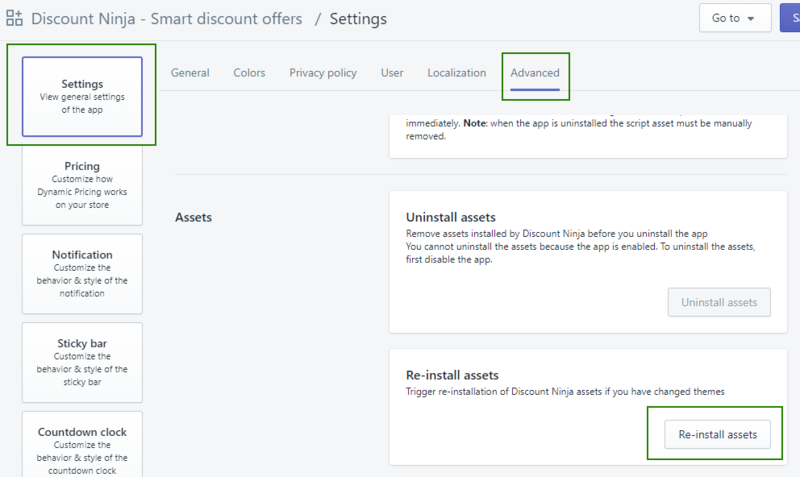 When you install a new theme, you'll need to reinstall Discount Ninja's assets. Note: you may also need to have Dynamic Pricing reconfigured when you install a new theme.